The world’s oceans are both vast and powerful, and every day huge amounts of energy is created as sea water moves around these oceans in the form of currents and tides. The oceans tides are created by the gravitational pull of the moon on the Earth’s waters and as the ocean tides rise and fall, billions of gallons of water moves around our planet every day. The physical movement of this quantity of water requires a lot of energy, and it is this tidal energy, also referred to as tidal power, that can be harnessed to create electricity using devices known as Tidal Fences. There are two main ways that have been developed in which the energy of the tides can be used to produce electricity. The first way requires a huge concrete dam, called a tidal barrage, to be built across an estuary located in a bay or inlet which has a high vertical tide range. The disadvantage of tidal barrages is that it is a slow process because it takes 12 hours for the tide to rise to its highest level, reaching high tide. Then another six or so hours for the tide to retreat back again, reaching low tide. The biggest disadvantage of a tidal barrage is the effect a tidal barrage can have on the aquatic plants and animals that live within these estuaries. Also building large dams and structures across tidal estuaries is an expensive process, therefore the best tidal barrage sites are those that exist where a tidal bay has a narrower opening, thus reducing the length of the dam required and also its impact on the environment. Another type of tidal stream generator design that uses the movement of the ocean’s currents, flows and streams created by this constant ebbing and flowing of the tides to generate electricity is called a Tidal Fence. A tidal fence is effectively a continuous row of vertical axis turbines mounted in a fence (hence its name) spanning across channels or long straights between large bodies of land such as an estuary or bay and are an alternative to a conventional concrete barrage. The majority of the sea water which passes by, is forced through the turbines generating electricity. As they extract mostly kinetic energy rather than potential energy in a flow, the natural flows within an estuary will be less disrupted and have less impact on the environment than tidal barrages although they can disrupt the movement of large marine animals. They are cheaper to install than tidal barrages too. Then “tidal fences” harness the energy of tidal currents and tidal streams to generate renewable, pollution free electricity on both the incoming and outgoing tides. 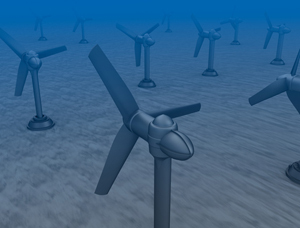 Large underwater turbines are used for harnessing the tidal power to generate electricity. These tidal turbines may be Vertical-axis or Horizontal-axis models, determined by their orientation to the sub-sea, rotating a shaft that turns a gearbox linked to a turbine with the help of large, slow-moving rotor blades. Tidal power is a much denser form of renewable energy than wind power. The oceans water is 832 times as dense as air and being a fluid it is not compressible. This means that a lot more power can be extracted per square meter of area using tidal fences than by using offshore wind turbines. Like wind power, tidal power is also a function of the velocity of the tidal current flow, cubed ( V3 ). As the flow of the tidal water peaks to its maximum flow rate, the power extracted from it by the tidal turbines also increases geometrically. As a result, the energy density of the sea water is further increased by the massive size of the worlds oceans and the physical scale of the tidal currents it produces as the tides change from high to low and back again. many years in advance as the tides of the ocean are forever occurring due to the gravitational pull of the moon and the rotation of the Earth that causes them to move. So as long as the moon exists and the world rotates, tidal power can be harnessed. Also, tidal fence generators may be joined together in series to create larger tidal fence fields capable of generating electricity on a scale comparable to the largest existing fossil fuel based, hydroelectric or nuclear energy generating stations. In comparison to other energy sources, tidal fence energy generation has the potential to provide just as a large source of energy. The advantage that a tidal fence and tidal stream generator has over these other forms of power generation is that it is a non-polluting sources of energy. There are no fossil fuels being burned to create power. There are also no chemicals involved in producing the electricity, and there isn’t any waste water emission and produce no pollution or greenhouse gas emissions into the atmosphere. Tidal fence and tidal current generation is sustainable because tides occur consistently four times in a 24 hour period and will return even if we harness the currents for energy. Tidal current energy is not be affected by global climate change and as its underwater, its not affected by storms or hurricane damage. Estuaries are typically sensitive ecosystems so blocking them off with long tidal barrages can do more harm than good. But tidal fence and tidal energy generation is designed to go with the flow of the water allowing flexibility in the delivery of a suitable balance between environmental impact and energy production compared to a barrage-type scheme whilst at the same time allowing and maintaining open channels for the navigation of shipping and recreational boating. Tidal fence based ocean energy does not involve or require fuel transportation or storage. As with other alternative methods of generating electricity and being underwater, the turbines have little impact on the local environment. Also, tidal fence generating systems typically would send the power through an underwater cable to the electrical grid onshore so are not visible from the shoreline, making local communities more receptive to them than large arrays of offshore wind energy projects. The cost of installing tidal fences and tidal energy systems can be quite high as it generally requires large capital investment in infrastructure, turbines and support ships, but once a “tidal power plant” is built and in place, the energy it generates is essentially free with this type of renewable energy system being relatively inexpensive to run and maintain. To learn more about “Tidal Fences”, or to explore the advantages and disadvantages of how tidal energy is being used as an alternative energy resource, then Click Here to order your copy from Amazon today and find out more about tidal fences, blue energy, tidal energy, and the energy revolution from the sea. Wind is the way to go! We all know that we can not depend on the fossil fuels forever. Not just because they are limited in supplies but also due to their environmental impact. So what if wind turbines kill a few birds here and there, it is still better than relying on other tidal and wave energy sources that have negative environmental or marine consequences. Besides, I believe it is only a matter of time before we find a way to eliminate the amount of bird deaths and reduce the noises generated by the turbines. Wind energy is the only clean and reliable source of renewable energy!